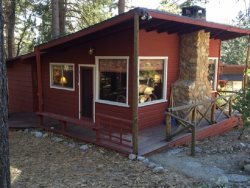 A true log cabin hidden among the cedars, oaks and pines, this gem is located 2.6 miles outside the center of town. This is a really beautiful cabin with the perfect combination of rustic, clean, and classy. You enter through the very spacious kitchen that has everything you need to prepare gourmet meals or just snacks for the family. Top of the line everything in this kitchen make cooking a pleasure... Attached to the kitchen is a large dining table big enough for everyone to eat or play games. Hang a left and you enter the giant living room. Super comfy furniture with plenty of seating for all. You can cozy up in front of the wood burning stove, read or play games around a big coffee table. All the modern amenities are provided, including a strong WiFi connection, a large screen TV with Fire Stick and DVD player. There is also a washer and dryer located in the hall. Directly across the hall from the laundry, there is a spacious bathroom with a vintage claw foot tub. Up the stairs, there are three bedrooms that offer comfortable sleeping space for a total of seven. The master has a Queen bed, a spare has a full, and another with two twin beds. Also located upstairs, is a full bath with a shower. Back down the stairs you exit onto a GORGEOUS back deck complete with wood dining table and lots of patio seating. Also, there is an 8-person hot tub, large hammock, and gas grill. The property has many opportunities abound for taking in nature. Kids can scramble on boulders and play on the swing in the yard while the adults enjoy a cup of coffee or a glass of wine on the deck. Maybe bring binoculars so you can get a closer view of all the wild life that frequents the property. Squirrels, deer, and too many varieties of birds to list. This home is really second to none!